eNannySource.com Corporate Care Solutions Providing simple solutions to your employee’s childcare needs. How Does Corporate Care Solutions Work? Employees can hire a caregiver with confidence. All of our corporate care providers have a preliminary background check on file. It’s a win-win! Employees are more productive, corporate morale increases and employers stop unnecessary revenue loss when employees can show up for work because they don’t have to worry about childcare. eNannySource.com gives parents access to the largest network of nannies and babysitters. Managing kids, career and home is no easy feat. From sick care to school closings, parents struggle with finding reliable, affordable childcare. From full-time care to back-up care, with eNannySource parents can locate caregivers based on their personal care needs. With a pool of background checked caregivers available nationwide, finding quality, convenient and affordable ongoing, back-up, occasional or emergency childcare near home has never been easier. 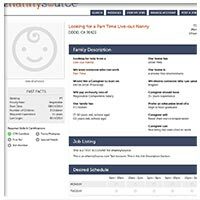 eNannySource.com has been a leader in the in-home childcare industry since 1994 and has helped more than 500,000 families across the United States find qualified caregivers that meet or exceed the needs of their families. eNannySource.com provides employers with a simple, low cost and low maintenance employee benefit. With our easy to use and co-branded interface, employees feel supported in their effort to manage their kids and careers and are able to put their childcare dilemmas behind them. eNannySource eliminates the need to provide time consuming location-based childcare resources and referrals to employees. And unlike center based programs or traditional brick and mortar referral services, online nanny recruiting sites operate all of the time, everywhere. Research shows that companies that support their employees in effort to manage kids and careers reap the rewards. When you provide your employees access to quality childcare you can expect decreased absenteeism, reduced turnover, improved job satisfaction, improved morale and more consistent productivity in the workplace.